Two facts to reconcile: Every lady dreams of a wedding that she will love reminiscing for life. I suppose no one will oppose to that statement. Second premise: Wedding celebrations entail much cost. The range is difficult to specify, considering the diversity in choices. Before going further, let me mention my authority in pooling up the tips you will be reading. Card making is my hobby and I started earning from it since 2007. Then, I put up a one-stop bridal shop. 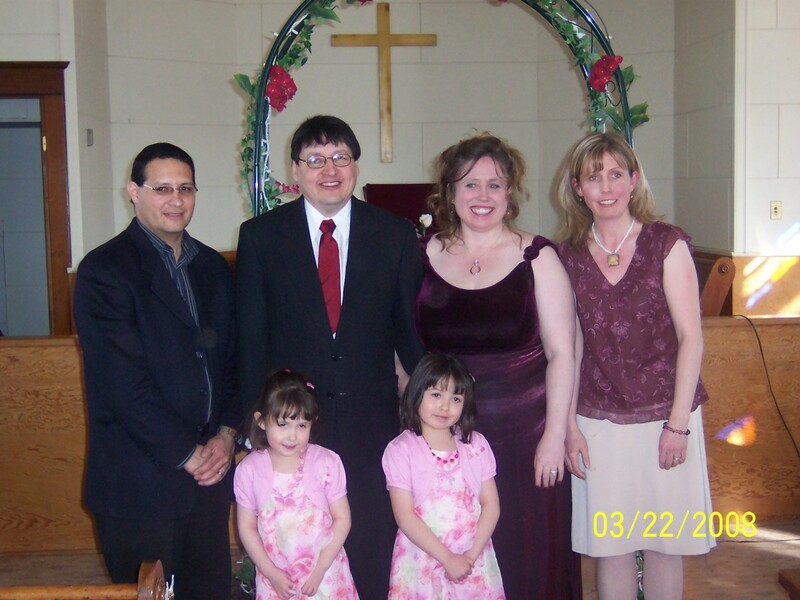 I say one stop because I am offering several major items in a wedding gowns and suits, jewelries, cards, wedding favor and other minor items (pillows, veils, flower girl baskets, coin holder, etc). I also allied with other wedding service providers such as wedding photography, catering, florists, wedding cake maker, event planner and others. With that, I offer a line of options to a bride once she steps in my shop. 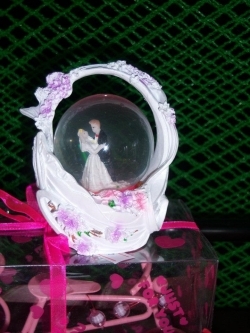 Photo shows one of the items in my shop - groom and bride ceramic wedding favor. If you are planning or preparing for your wedding this Christmas, you may be running out of time. It is indisputable that planning is the key but the real question is: Do you really need to hire a wedding planner? Why pay for a wedding planner. Believe me, you will do the planning anyway if you want your wedding to be up to your standards and taste. So, instead of hiring a wedding planner, get a copy of the planner and organizer I personally picked for you on Amazon. With this on hand, you will find out that planning a wedding is not as hard as it sounds and you will feel great not having spent and wasted money for something you can do yourself and enjoy. This item is complete with checklists, worksheets, ideas and all you need to plan for your big day. It is just a click away. Too long? Not really! There are too many things you have to be concerned about so start planning ahead. By doing this, you will cut maybe 50% or more. Let me give your 5 lists to start with on the 365th day away from your date. I am listing in the order of priority (according to my personal view, of course). 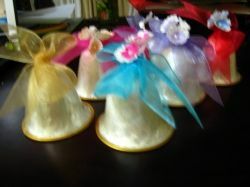 Photo shows small bells made of capiz shells. It's a great wedding favor. Can you do much if you do it all by yourself? Take a look at these tutu dresses in the video below - okay, it may be easy to do and it would really be nice if you can make it for your flower girls but do you have enough time to do everything? 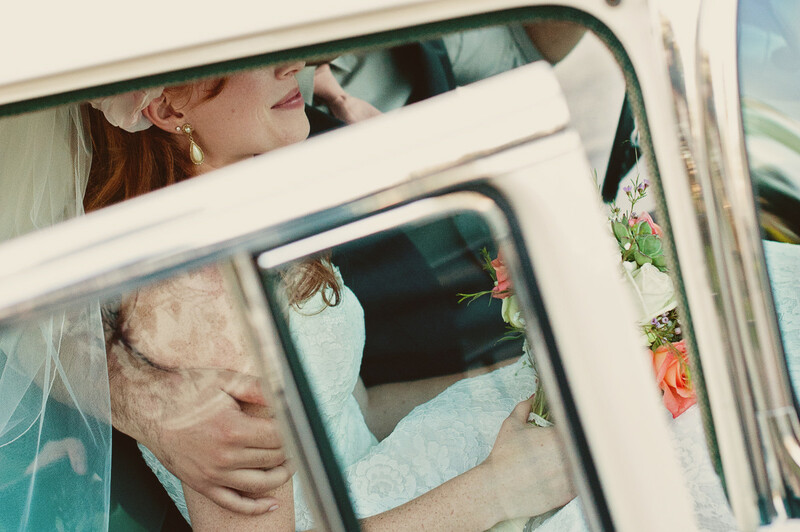 Most brides think that they have ample time until few days before the big day. Why should you not just buy an empty notebook and list there what you need? The two journal I selected for you here contains expert lists on what you need to consider. You will be filling up some portions which will serve as your guide, reminder on the dates to beat, and most of all - a keepsake to keep after your wedding celebration. Jot down special details about your wedding dress, notable experiences who had while shopping around for your wedding items, or memorable events during the proposal (detailed in every bit)......... You will surely thank me for introducing you to this journal. You will soon value it as precious as your wedding photos and videos. What type? If you wish to categorize wedding celebrations, the list may be long. Let's stick to the more common one. Is it formal or informal; theme wedding or not; traditional or "one of a kind" and where - hall, beach or destination wedding. You see, what you will need depends on what would you like to have. Of course, each type or a combination of two or more type (ex - informal; theme and destination just like when you have a wedding celebration in a beach and the theme is mermaid and fairytale) will entail different costing. Spend time researching. Feel what's trendy and check prevalent prices to see if your target budget is adequate. Then get a journal and start listing what you will need. 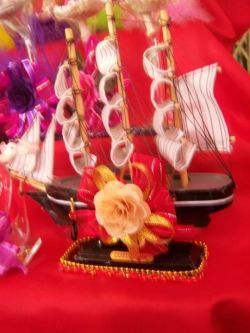 Photo shows a boat/yacht wedding favor. or weddings celebrated on a beach destination. What I used to etch these two wine glasses? Creating craft and arts is not only a hobby but also a stress outlet. Pour in your emotions while doing your it and you will surely feel great with your output even if you were in bad mood at first. Why do you need to list these people in your circle? You need to inform these people after you have done your initial planning. They will offer their services for free or at least, at a discounted rate. People who love you are more than willing to participate and volunteer their talents, time and penny to make your moment perfect. Why deny them the opportunity to show you how they care for your day. It's not begging; it's part of organizing joint efforts to come up with a memorable event. My sister got a really beautiful wedding cake, courtesy of my aunt who loves baking and prides herself training students in culinary arts. Bridal bouquet, guest corsages and table skirting were done by her too. Glance at the photo I put after this section. The etched wine glasses are my artwork. And you got it right; I did not charge her for that. Her gown plus the coat and dresses of the whole entourage and invites were free too. 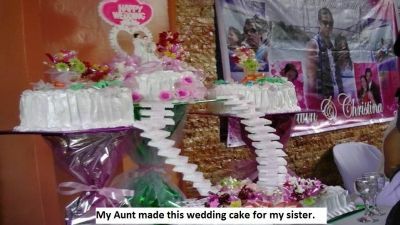 The church and venue decorations plus the mouth-watering strawberry with cream and choco dessert was courtesy of her colleagues in her office who beat the night totally sleepless to make it. Although she bought the materials, the labor of her colleagues, which is considerable, was free. Now, would you think it is possible to cut cost by 50% or more? I'll give you another real-life example. I have a friend who just celebrated his wedding last December (2012). He applied this idea and cut cost on his catering services by tapping the HRM (Hotel and Restaurant Management) students of the school where he previously worked. It was a win-win situation - the students were looking for an opportunity for OJT for their course. It perfectly fits serving in a wedding. How much would it cost you to pay a caterer with professionally trained crew? 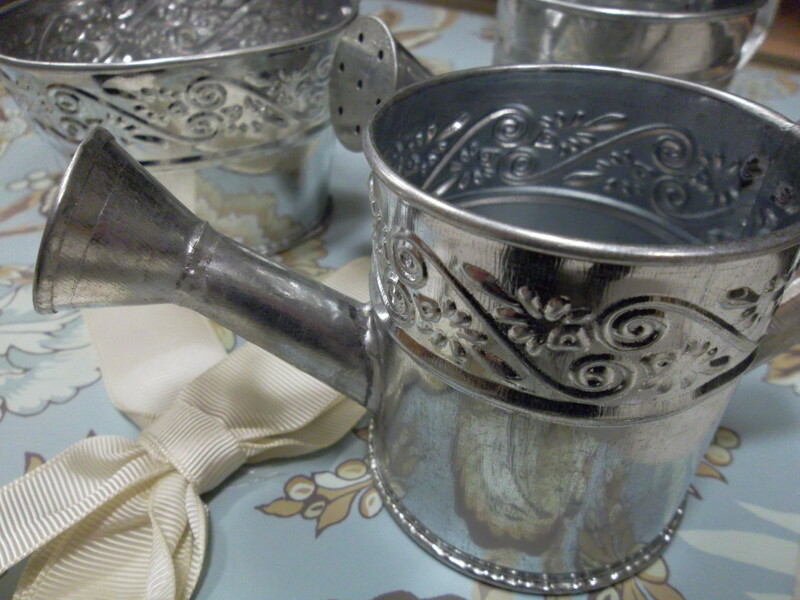 Photo shows the wine glasses I etched for the toss. 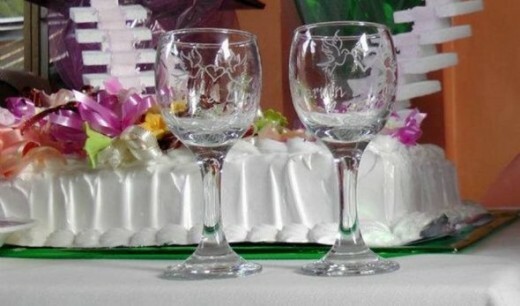 It may not be seen clearly: the glass contains etched two doves and a heart, the bride and groom's names, date of the wedding and a rose bouquet. Then, be ready for alternative options. The internet abounds with wide options in terms of design, materials and cost. Why not go sourcing what you need from a third world country, like mine? Pay for the shipping and see that it is still lower in cost. You just have to consider the time for the item in transit. I personally recommend a supplier that could offer you various services because most often, you will get discount by availing of more than one item or service. Most often, you can get the card and favor from one supplier. In that case, try to haggle for a discount on the second item. If you see an interesting site, send them a message or email. It will become your reference soon. It is a way of keeping the website address in your inbox for future reference. It's a way of screening out fake sites as well. Some sites are there to boost page ranks or for SEO purpose only. If you get a reply, you will feel more confident that the supplier is genuinely in the business. Photo shows a wooden invitation card that you can buy online. (I obtained permission to post this item. The best way to buy a token or favor is just after Christmas and New Year. Notice that there are small cute items being sold for the Yuletide and excess stocks are offered at discounted price on January. There are two reasons for this: 1. store owners want to dispose of excess stocks because they prefer to get back their principal investment rather than wait for another year. 2. They want to lure buyers. Most are trying to be thrifty at this time of the year because of overspending the prior month. Be clever to identify items that can easily be remodeled so that it will not look like it's Christmas when you're wedding is June. 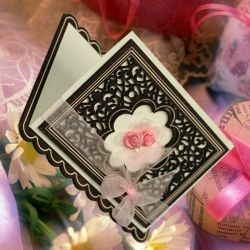 If you are planning to make your own wedding card, January would be the best time to look for items to embellish it. In case you want to put dried flowers, purchase those on the 15th of February or on November 2. At these dates, I see lots of flowers in my city offered at very low price by sellers who got too much stocks than what they were able to sell. I will be creating more articles focusing on how you can cut costs on each specific item for your wedding, so stay upbeat - give me another visit soon. Samples? Can you cut cost and have an awesome wedding invite by DIY? My answer is "yes" and "no". If you are crafty or want to learn how to be crafty, it would surely save you costs. No, if you are bored making crafts. Fact - I had encounters with brides who will come to me to rush up their invite because she had tried making it herself but get frustrated in the end. If you need special effects such as embossed print and gold or silver stamping, better have it be made through cheaper options. 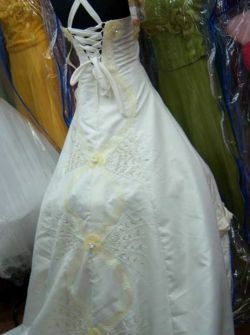 Another one: on wedding gowns - Instead of having it be sewn specially for you, look for the design you like most on the net. See if the back portion is a cordon type design (I mean, you tighten it by tying a cord just like fastening your snickers). Unless you can sew a gown yourself, this option is what I see the best. In my location, if you want a gown is sewn to your exact measurement, price starts from $300 and goes higher depending on the materials you want and design. If you select a readymade and just have it be altered to fit your contours - it will cost one-third. So, that is about at least 67% off price cut. Why go for cordon type (check the photo I attached)? It will not need much altering. Why do I know this? Because I run a gown rental shop and I do not even have good background in sewing. All my items are cordon-type. Now, it just needs extra sewing by hand to fit the waist area, the bust and the buttocks. In most cases, just fasten the cord and it will fit her, following delicately her contours. 2. A bride who is filled with too much ideas that she is very overwhelmed on which fits her wedding more. One thing in common, brides wants the best but most of the time not willing to spend much. That's expected because of the fact that several items needs a portion of the total budget. So when she comes to you, she'll surely haggle on your item's tag price. If you are a bride-to-be, you're reading this because you are practical bride; you 're searching for ways to save and you do not want to waste money for overly priced wedding items or services. The key is learning from the book listed below. Before starting your plan, it is highly recommended to read these guidelines. They are detailed and complete. So many great ideas. Very nice article. Hi, great lens. When I got married we did our best to cut the unnecessary costs, that's why your lens interested me so much!